The addition of scallops turns a traditional grapefruit and avocado salad into an elegant entrée. The antioxidant duo of thyme leaves and a hint of ginger gives this dish an unexpected, yet perfect pairing of flavors. 1. Gently toss grapefruit segments and avocado slices in medium bowl. Set aside. Mix vinegar, 1 tablespoon of the olive oil, shallot, 1/2 teaspoon of the thyme, 1/8 teaspoon of the salt and pepper in small bowl with wire whisk until well blended. Set aside. 2. Mix remaining 1 teaspoon thyme, ginger and remaining 1/4 teaspoon salt in small bowl. 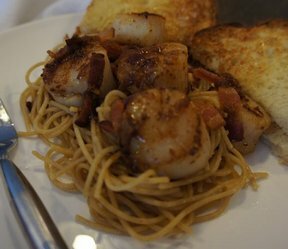 Coat scallops evenly on both sides with spice mixture. Heat remaining 1 tablespoon oil in large skillet on medium-high heat. 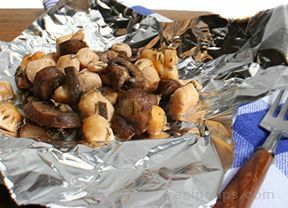 Add scallops; cook 6 to 8 minutes or until scallops are golden brown, turning once. 3. Divide spinach evenly among 4 serving plates. 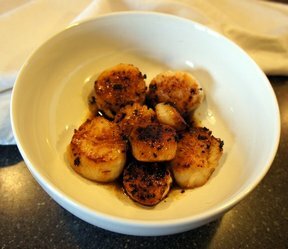 Top each with scallops and grapefruit mixture. Drizzle each salad with about 1 tablespoon of dressing. Serve immediately.